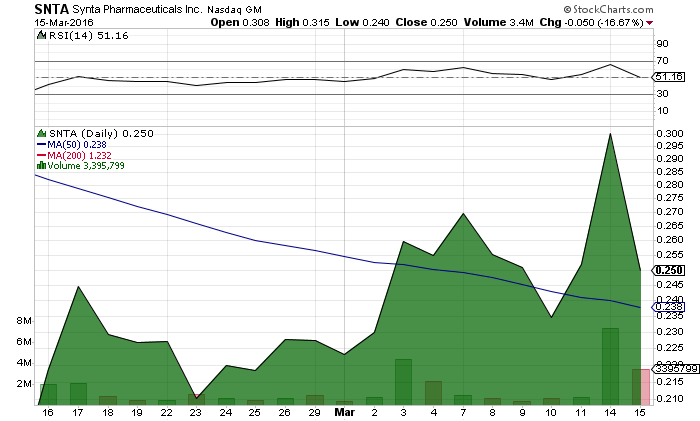 Synta Pharmaceuticals Corp. (NASDAQ:SNTA) has almost doubled since hitting its 52-week low. SNTA has more cash than its market value as of the quarter ending September 2015. This means the company could issue cash distribution of over $57 million to shareholders and still pay off all of its liabilities. Shareholders would immediately see a return on investment of over 40% with the distribution from current levels. If STNA decided to distribute cash to shareholders and not pay its liabilities, it has over $88 million in cash equivalents which is almost double the current market valuation of the company. SNTA seems to have gone irrationally low, given that it is trading less than its cash value which is quite unbelievable. It seems that investors would be better off with a distribution of the remaining cash then revisiting its 52-week low again. SNTA does not have any meaningful recent developments from the company. SNTA entered into a license arrangement for its calcium release-activated calcium channel (CRACM) program, including two candidates and the associated intellectual property portfolio, with PRCL Research Inc.
SNTA’s 52-week high is $3.17 and 52 week low is $0.15. Volume has been skyrocketing in the last few trading days far exceeding average daily volume. Over 3.4 million shares traded hands on Tuesday far above its average volume of 1.21 million shares. The share price is currently trading above its 30 weekly moving averages but below its 200 day moving average which is a long-term bearish signal. SNTA is currently trading at a $41 million market valuation. SNTA has been staging a rally since hitting an all-time record low. Most companies have a floor in the share price which is their liquidation value but SNTA seems to be defying logic. Either there is something worse coming down the line or investors have an opportunity for easy gains given it is trading almost less than half of its cash value. We will be updating on SNTA when more details emerge so make sure you are subscribed to Microcapspot so you know what’s going on with SNTA. Disclosure: we hold no position in SNTA either long or short and we have not been compensated for this article.